TEU is a professional manufacturer and supplier of electric counterbalance forklift trucks in China. 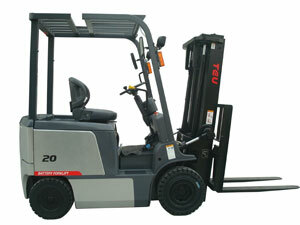 We can provide electric forklifts with the lifting capacity of 2T. The 2 ton electric forklift truck is suitable for a variety of indoor and outdoor operations, including loading and unloading goods, line feeding, stacking, order picking and horizontal transport. It becomes more and more popular for its environmental protection. Electric counterbalance forklift truck is even treated as an ideal replacement for engine powered forklift. TEU 2 ton electric forklift truck adopts drive system with independent design, low noise and high efficiency. We also select imported motor and electric control units to ensure high reliability of hydraulic parts. Our company can customize different types of electric forklifts according to customers' needs. Our 2 ton electric forklift trucks have gained ISO9000 certification and CE certification. TEU owns a technical development team who pursuits the best cost-effective products and provides high quality and timely service. Low noise and high productivity are prominent features of 2T electric counterbalance forklift truck. 2 ton electric forklift truck can be operated flexibly. There are three converting modes that can provide support for skilled drivers. Working time is accelerated by 15%. It can reduce battery power consumption (economy mode). 2T electric counterbalance forklift truck is mainly composed of power unit, transmission, steering device, working device, hydraulic system and brake device. After working, 2 ton electric forklift truck must conduct a routine maintenance. It should conduct a first class technical maintenance when it works for accumulated 100 hours. A class of working system is equivalent to two weeks. This electric counterbalance forklift truck should conduct a secondary technical maintenance when it works for accumulated 500 hours. A class of working system is equal to a quater of a year. TEU can provide 1.5-10T diesel forklift, 1.5-5T gasoline forklift truck and 1.5-4T electric counterbalance forklift truck. TEU possesses vehicle assembly lines, painting lines, standard test sites and various testing and detection equipment and facilities. We have established perfect quality management system to dominate the process of design and development, purchase, raw material inspection, defective goods, manufacture and service. Our 2 ton electric forklift trucks have been exported to Southeast Asia, South America, Africa and Europe.